Like morphine and opium, heroin is formed, from the resin of the humble poppy flower, and the addictive opioid is consumed by an estimated 9.2 million people worldwide. It should come as no surprise that a drug with such a high usage has several names. Depending on the nature of the conversation, heroin goes by many names. Cops, Doctors, Users, Dealers, all use different words to refer to heroin. Also, heroin has several names and nicknames across different countries and in different languages. But how heroin street names can an average person recognize? Let’s find out! Let’s begin with the classics. Of all the nicknames for heroin, these are the ones that have stood the test of time. Hero – For some, heroin might be their hero. China White – This is a name for a synthetic form of heroin, inspired by the well-known color and the origin of the drug; opium has a long history in China. Skag – A common British nickname. Dope – A name for heroin on the streets. Horse – Because too much can kill a horse. Coffee – A slang term that relates to the color of unrefined heroin. Mexican black tar – Denotes a type of heroin produced in this specific geographical area. Brown – Another nickname that refers to the color of heroin. For some reason, it seems that heroin lends itself well to animal-based nicknames. Here are a few animal-themed heroin street names we dug up. Dragon – Smoking heroin or opium is called chasing the dragon. White Horse – Connotes the magical elements of heroin just like a majestic white horse. Black Eagle – Represents the strong power of the drug, much like an eagle. Horse – A strong horse just like the strength of this opioid. Mexican Horse – Inspired by heroin’s Mexican origins. Spider Blue – A name used to speak of the drug without suspicion. Bull Dog – We know bulldogs are sometimes feared, just like some people fear heroin. Top Dog – Heroin is a very popular drug. Tiger – Because of the aggressive power of the drug. The following heroin nicknames are a little more unusual than the ones we’ve looked at so far. Do you know these? Snowball – Referring to the white appearance heroin can have, much like snow. Diamorphine – The chemical name for this strong opioid. C21H23NO5 – The chemical formula for heroin. Tar – Heroin can come in many varieties, including one described as black sticky tar. Big Harry – Using Harry instead of “heroin” is memorable, short and catchy. Dooley – Also memorable and catchy, this nickname is very unique. Aries – An inconspicuous name used purely for disguising the topic of conversation. Antifreeze – Yes, it makes no sense. Perfect for ensuring no one knows what you’re talking about. Mud – Refers to the possible negativity, lowness of the drug. A-bomb – A type of heroin mixed with marijuana. Bars – The combination of heroin and alprazolam. Meth speedball – A slang label used on the streets referring to heroin is combined with methamphetamine. The unique label is used due to the potentially fatal combination. Tragic magic – Refers to the antithesis inherent in the drug; it both provides euphoria yet has negative consequences. Whiskey – This label likens the addictiveness and dependency of alcohol to heroin. Reindeer dust – This slang name is suggestive of heroin’s euphoric effects. Bad seed – A name used on the streets to indicate the adverse effects surrounding the use of this drug. Gear – A label used on the streets. Rocks – Small pure crystals of heroin. This slang word for heroin refers to the consistency of the drug and also suggests the harshness of it. Ragweed – This slang word refers to the ‘dirtiness’ of the drug. Scott – Slang word used on the streets to hide the real meaning of the conversation. Slime – Refers to the injectable form when mixed with saline or water. The joys and the pains of heroin use and abuse have been well-documented in both popular and academic literature. Here are a few effect-based slang words for heroin. Euphoria – One of the most common effects of heroin use is euphoria. Flyer – Heroin can give you euphoric feelings as though you’re flying. Happy – Heroin binds to receptors in the brain, inducing feelings of pleasure or happiness. Rush Hour – Not the Jackie Chan films but this name is suggestive of the rush this drug provides the user with. Sweet Dreams – This drug also binds to the receptors in the brain that are responsible for sleeping. Brain Damage – Although this one’s a little negative, maybe you like to be straightforward about the effects of Heroin. Daytime drug – Connotes being high. Evening drug – Represents coming off or down from the high. Bolt – Refers to the rush of intense feelings obtained upon using the drug. Noise – Suggests the way in which heroin creates commotion in one’s mind. Holy terror – Signifying the scary experience of the drug. Like most drugs, heroin is sold to users in pre-packaged amounts. The following slangs for heroin are all based on how heroin is sold as a product. Big Bag – Heroin can be packaged in large amounts. Brick Gum – Heroin is often disguised in other forms such as in gum packets. Blue Star – Dealers often mark their own produce with icons, such as the famous blue star. Blue Bag – Inconspicuous, easily hidden blue bags are often used to carry heroin and other illicit substances. Although there is nothing classy about heroin, junkies (heroin addicts), or the struggles that people go through with this drug, there are a few nicknames which seem to glorify heroin. Golden Girl – Meaning very popular or successful, heroin is well-known. Captain H – The captain leads, just like the effects of heroin. H – Straight to the point, “H” is short and simple. Red Eagle – A slang word used on the streets to idolize the drug. Pure – Used to refer to high-quality heroin. Snow White – Refers to the color of processed heroin. Brown Sugar – Heroin can have a brown powdery appearance, much like brown sugar. White Sugar – Heroin has the appearance of finely ground white sugar. Icing Powder – The name for a very different icing sugar to the one we would use on cupcakes. Joy Flakes – Like cornflakes. Foolish powder – Refers to the questionable use of the drug and the negativity concerning it and its effects. Cheese – Refers to when heroin is mixed with cold medicine. Salt – This label is to do with the color and texture of the drug. Dog food – Street slang for heroin used in New Orleans, referring to heroin’s resemblance to dog food in its raw state. Orange Line – Based on the sometimes orange-tinted appearance of the drug. Red Rock – Most often, heroin will be a white powder. However, this label is used for the commonly found ‘red’ or ‘brown’ heroin. These nicknames for heroin are all from the international language community. Many of these slangs are commonly used across the world. Caballo – This means “horse” in Spanish, with the strength of a horse representing the strength of heroin. Vidrio – Meaning “glass,” this Spanish word represents the pure white appearance of heroin powder. Gato – “Gato” translates to “cat” in English and is a unique name for the drug in the Spanish language. La Buena – Directly translating to “the good,” this phrase means the good stuff. Chicle – The English translation for this is “chewing gum,” suggestive of the similarly addictive nature of Heroin. Bombita – Meaning “little bomb” in Spanish, this name represents the impact of heroin use. Zoquete – Translates to the English word “oaf” which connotes the size and power of the drug. Carne – Translates to the English word “meat,” metaphorical for the density and strong effects of the drug. El Diablo – A Spanish word meaning “devil,” referring to the danger of the drug. It seems even heroin gets the star treatment sometimes. Here are a few celebrity–based nicknames for dope. Pluto – A Name for this drug based on the dog from the Mickey Mouse cartoons. Beast – Signifying the strong nature of the drug, much like the fairy tale beast. Al Capone – Connotations here imply a glorified view of the drug. Bart Simpson – This comical nickname for heroin is memorable and inconspicuous. Beyonce – Connotes to idolization, addiction, and the love of the drug. Much like people love and idolize Queen Bey! Sweet Jesus – This label refers to a possible exclamation upon using the drug or the indescribable effect of the drug. Heroin comes in a couple of different shades and tones. No wonder then that these color-based nicknames for heroin exist. White – Simply white, the appearance of the drug. White Nurse – Medically, heroin can be used to relieve pain. White Girl – A label used on the streets to imply the purity and ironic ‘innocence’ of the drug. Black Stuff – This slang term labels heroin consumption as a negative. White Stuff – Referring to the consistency and color of heroin. Black Pearl – Reference to the drug being unique, a specialty, and difficult to attain. Brown Rhine – This slang street term indicates a more common type of heroin that is brown rather than pure white. 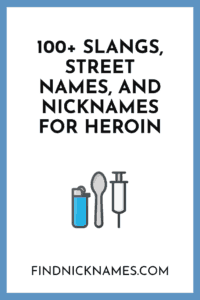 Well there you have it – a list of popular street names for heroin. Be a dear and drop a comment, if there is any street name, slang word, or even popular nicknames for heroin that we have missed. Also, you could tell us your country and the popular slang used for heroin in your country?